When looking at the time we have and everything that needs to be done, it can be easy to convince ourselves that the best course of action is always to double down on productivity. That mentality makes us do irrational things like skipping lunch to get more done and staying up far too late to try to pack in more productivity. I know we all have plenty to do, but I wonder if some of our extra exertion really helps us get more done or if sometimes it is actually counterproductive in the long run. Schools have well defined schedules, and it can seem like the most productive course of action is to always maintain a nose to the grindstone approach. The trouble is that we all have limits, and if we continue to push ourselves to our limits with no opportunity to rest or rejuvenate, we will not be at our best to serve teachers and students. Rest is hard for me. I want to solve the problems before me by working harder and longer than I thought I could, but I know that I need some rest in the middle of the whirlwind of work to really be my best. So I want to invite you into the challenge I have for myself: find a way to slip one or two of these activities into your routine this week. It won’t make the to do list go away. It’s not a time turner. It’s not the sort of rest that we need and get outside of the school day, but I wonder if this might give us a change of pace and boost of positivity that will provide us the rest we need to be even more productive as we move forward overcoming challenges and serving others each day. I think it’s worth a try. Here are five ways to rest that might even make us more productive in the long run. Every day in a school is filled with a whirlwind of activity, but in the midst of all those organized events are a multitude of opportunities to thank people. Verbalizing that gratitude makes an impact, but writing it out is somehow different. Take the few minutes to thank someone on your campus. Delivering that message will provide a boost for you and for the recipient. Become a force for positivity. As educators, there are plenty of hard days with tough situations. Given the myriad of challenges we face, intentionally adding some fun and kindness into your day will always be worth your effort. Post some of those “Take one” tear offs or some inspirational quotes in staff areas around your campus to make people smile or give them that extra reminder of the importance of our work. Maybe even ask a friend to bring soft drinks by for your team. It doesn’t take much effort to make people smile a bit and set someone’s day on a different trajectory. I can’t speak for you, but I spend a lot of time inside. I want to get outside a little more when time allows. If you can manage it and the weather allows, take a walk and get some sunshine. See if you can roll a couple of these together (i.e. Go with a friend to put encouraging quote cards under people’s windshield wipers in the staff parking lot). We all have plenty to do, but I really do believe that purposeful actions like these are a wise investment of our time. Our work is important, and while there will certainly be days that are truly just packed to the brim, if we can find ways to develop some of these other activities into habits in our routine, we might end up even better off in the long run. If you give this a try, drop me a note in the comments about how it goes for you. I’d love to hear about your experience! 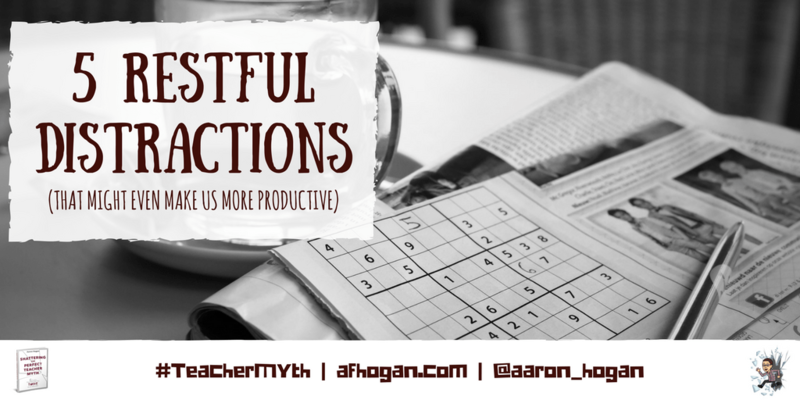 If you like what you’re reading here, you might like my book, Shattering the Perfect Teacher Myth: 6 Truths That Will Help You THRIVE as an Educator. The book highlights six truths that will help you THRIVE as an educator, including one–everyday every day–that talks about how big an impact our everyday actions really make. Get the book on Amazon or read more about the book here.